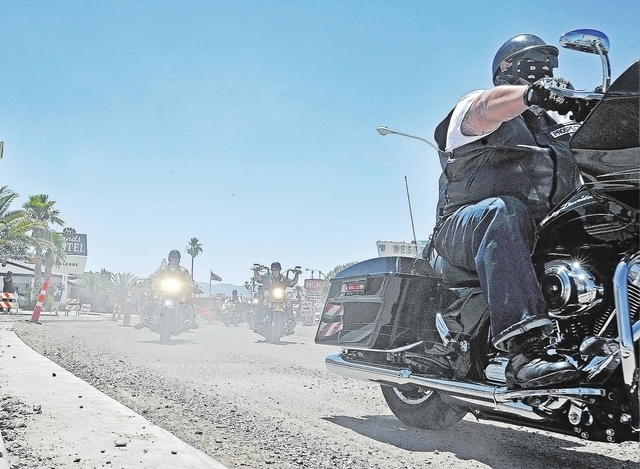 The Mongols Motorcycle Club is returning to Boulder City. The Las Vegas chapter of the California-based club will be hosting its 10th anniversary party Oct. 5 at the Boulder Inn & Suites, according to club attorney Stephen Stubbs. The party will attract about 100 people, and will be a “much smaller event” than the Mongols’ national meeting, which took place at the Boulder Inn in June 2012. Last year’s meeting attracted hundreds of bikers from across the country, and Clark County, and state and federal law enforcement agencies helped police the bikers’ activities. The Mongols are considered by law enforcement to be an outlaw motorcycle gang. There were no reported violent incidents involving bikers at last year’s meeting. The 30 citations issued to bikers were mostly for alleged traffic violations, and most were later dismissed in court. However, Mongols members later named Boulder City and Las Vegas officers in a federal lawsuit claiming their civil rights were violated when they were harassed by police at the event. Stubbs has met with Boulder City Police Chief Bill Conger, and said he does not anticipate any law enforcement harassment at the Oct. 5 party. “I think it would be stupid with the lawsuits in place,” Stubbs said. Many motorcycle clubs have met at the Boulder Inn since the Mongols’ national meeting, without trouble, said Stubbs, who also represents the Boulder Inn. With the privacy it provides, its large number of rooms, and owners who support motorcycle clubs’ right to have gatherings, the Boulder Inn is “completely ideal” for the type of event, Stubbs said. Mongols members have attended some of the other gatherings, and two Mongols even moved to Boulder City following the June 2012 meeting, Stubbs said. “(Mongols) have been hanging out here constantly for 15 months,” Stubbs said. Conger said he is not anticipating any trouble associated with the Oct. 5 party, but there will be additional law enforcement in town during the weekend, the same weekend as Art in the Park. Former Police Chief Thomas Finn was in charge of the department during the June 2012 meeting. Finn’s handling of the event was publicly praised by city officials. However, many citizens and downtown businesses criticized the large police presence, claiming it hurt business. Reporter Jack Johnson can be reached at jjohnson@bouldercityreview.com or 702-586-9401. Follow the paper on Twitter: @BCReview.